Good afternoon. 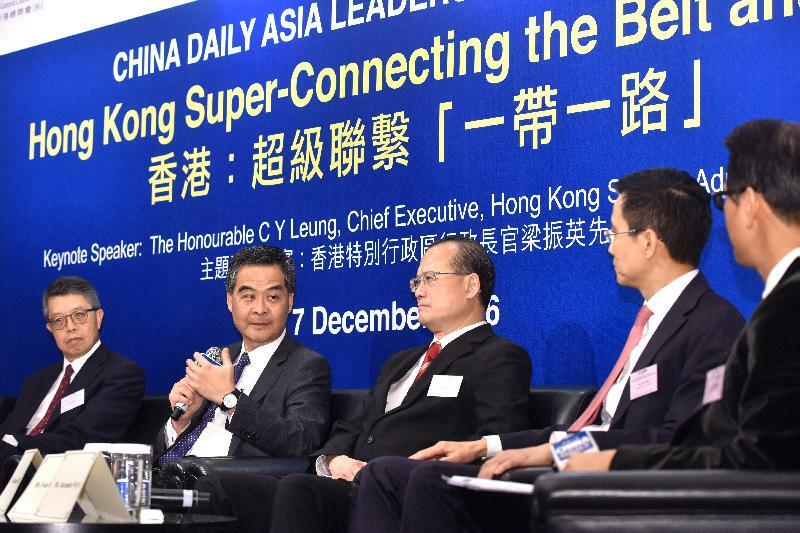 I am pleased to take part in the second annual China Daily Asia Leadership Roundtable Luncheon, sharing with you my thoughts on today's topic, "Hong Kong Super-connecting the Belt and Road". Many of you, I am sure, attended the inaugural Belt and Road Summit organised by the Hong Kong Government in May. We were privileged to hear from Mr Zhang Dejiang, Chairman of the Standing Committee of the National People's Congress, on the country's vision behind the Belt and Road Initiative, as well as how Hong Kong could contribute to this far-reaching project spanning three continents and over 60 countries. 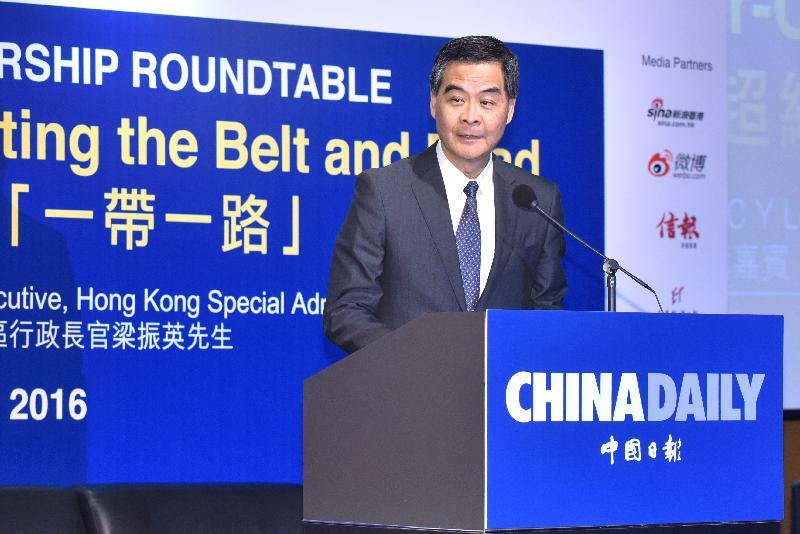 Indeed, the Chairman endorsed basically what I said at this luncheon a year ago, that Hong Kong can play a pivotal role in the implementation of the country's Belt and Road Initiative. This initiative is, at heart, about promoting connectivity, development and progress amongst peoples and markets. And it's not just among markets. It's amongst peoples and markets. And Hong Kong can play a key role in all these. We are, in the words of Mr Zhang, "a key link for the Belt and Road", and we could play a pivotal role. It's a succinct statement from the Chairman, and one that echoes today's topic - Hong Kong, as a "super-connector" that links the rest of China with the rest of the world. So what does a small city like us, counting a land area of just over 1 100 square kilometres, offer to merit such faith, such confidence? The answer lies in our "one country, two systems" arrangement. Hong Kong is part of China and therefore offers the "China advantage". Our goods and services enjoy preferential access to the Mainland of China under measures such as CEPA. But unlike Mainland cities, Hong Kong offers the additional advantage of practising, so to speak, "the other system". We have in place a separate economic and social system, a highly cosmopolitan society and worldwide business connections. We have open borders. We have open markets and we have open minds. Hong Kong is a welcoming society. And therefore, under this "one country" and "two systems" arrangement, we have the double benefits of "one country" and "two systems" - well placed to "super-connect". To bring China together with countries around the world - including, of course, those along the Belt and Road. One such area where we "super-connect" is of course financial services. "Highly competitive and well capitalized, serving as a leading global hub" - and that was how Washington's Heritage Foundation described Hong Kong's financial services in naming Hong Kong, our city, the world's freest economy for 22 years in a row. Without capital, the Belt and Road and its massive infrastructural projects cannot leave the drawing boards. Hong Kong can make things happen, and for a host of reasons. Starting with our stock market - one of the world's largest, and one that is linked, now, with both the Shenzhen and Shanghai stock markets, following the launch of the Shenzhen-Hong Kong Stock Connect just two days ago. And we topped the world in equity funds raised through initial public offerings last year, and again in the first 10 months of this year. There is no shortage of financing here. Not with 75 of the world's top financial institutions in operation in the city. And the success of our two sukuk issuances in the past two years displayed to the world our ability to launch Islamic financial products and manage their financing needs. That can only help us down the road, given the number of Islamic countries backing the Belt and Road. China's currency, the Renminbi, is likely to play an increasing role in financing Belt and Road projects. It helps that the International Monetary Fund added the Renminbi to its Special Drawing Rights currency basket in October. Hong Kong can only gain from this. After all, we are the world's Renminbi settlement centre, with banks here accounting for 70 per cent of global offshore Renminbi payments. We are also well equipped to meet demand for asset and risk management, as well as corporate treasury services from companies and financial institutions riding the Belt and Road opportunities. To make Hong Kong even more attractive in this respect, our legislature passed a law not long ago to provide tax concessions for qualified corporate treasury centres. More than capital is needed to make the Belt and Road run. Professional services of all kinds will be in great demand. In this, we are blessed with a winning variety of multi-lingual, multi-talented professionals. Certainly, Hong Kong knows infrastructure. Our professional services sector - architects and designers, construction planners, builders and project managers - have created, in Hong Kong, one of the world's great cities filled with the most modern buildings and the most efficient infrastructure. Our legal professionals and all the other talents needed to package deals and contracts, manage business disputes and handle investment protection and property rights are second to none. To help our professionals reach out to markets outside Hong Kong, I announced in my Policy Address this year a HK$200 million allocation for supporting Hong Kong's professional services. The new Professional Services Advancement Support Scheme, PASS, funded by this allocation, has just started to accept applications. We will fund non-profit making projects for increasing exchange and co-operation with professionals in external markets, and for carrying out publicity activities, research and studies to enhance the industry's competitiveness. Speaking of Hong Kong's "super-connectivity", logistics is clearly part of it. Being in the heart of Asia, and at the doorstep of the Mainland of China, Hong Kong is, perhaps quite naturally, a logistics hub. Indeed, Hong Kong is within four hours' flight from Asia's major markets. Half the world's population is within five hours. That explains a lot about Hong Kong's thriving logistics industries - sea, air and land. The Hong Kong Port is among the world's busiest and most efficient. About 340 container vessel sailings a week leave Hong Kong to about 470 destinations worldwide. Hong Kong International Airport, meanwhile, has been the world's busiest in terms of international cargo. As for the passenger side, more than 100 airlines run some 1 100 flights a day to 190 international destinations. And we are building an even better aviation hub, moving ahead with a three-runway system. When completed, our airport will have the capacity to handle about 100 million passengers and 9 million tonnes of cargo a year. As for land transport, we are well into completing our section of the Hong Kong-Zhuhai-Macao Bridge. A journey from Hong Kong International Airport to Zhuhai will, by then, drop from four hours to about 45 minutes, boosting our cargo flow in the Pearl River Delta's western reaches. Such is our connectivity. It makes business easier for our import-export sectors. And it can play a valuable role in linking economies, businesses and projects along the Belt and Road. Among the 60 or so countries, Hong Kong has marine cargo movements with 45 of them, and air services agreements or international air transit agreements with 40. And we have more to offer than just moving cargoes around. Our maritime services, for example, are well developed - ship registration, broking and chartering, finance, marine insurance, maritime law and arbitration. Over 700 companies in Hong Kong are already offering a great variety of high value-added maritime services. This October, the International Union of Marine Insurance set up its Asian hub in Hong Kong, the Union's first offshoot outside its headquarters in Germany. The Hong Kong Maritime and Port Board will formulate strategy to promote the development of high value-added maritime services on all fronts, including manpower, marketing and promotion, as well as industry development. Hong Kong's railway management expertise, I should add, is in demand all over the world. The MTRC, with which we are so familiar, runs the metro system in Stockholm, Sydney, as well as London's future Crossrail train service, which is described, the Crossrail, as one of Europe's largest infrastructure projects today. The MTR Academy, announced in my Policy Address this year, will train railway professionals and raise the quality of local and overseas railway services. And we look forward to providing and running these infrastructural projects: the "O", the operation, in the BOT formula - build, operate, transfer - working with the rest of the country. Building, operating and transferring these projects in Belt and Road countries. And of course, Belt and Road is not just about business. It is also about promoting understanding and interaction among cultures. About building friendships between communities and peoples - particularly our young peoples. And here is where education comes in. The Hong Kong Government has put a priority on building people-to-people ties with countries and regions along the Belt and Road, starting at the post-secondary level. Last December, the Government launched the Hong Kong Scholarship for Belt and Road Students, with a focus on attracting outstanding students - starting from Indonesia - to pursue undergraduate studies in Hong Kong. The plan is to gradually expand the scholarship to other Belt and Road countries. And we are doing just that. We have just extended the scheme to Malaysia, offering 10 scholarships to Malaysian students enrolled in undergraduate programmes here, beginning in the next academic year. We welcome the private sector to join us in offering Belt and Road scholarships. I am glad that our Hong Kong students are now taking a greater interest in the Belt and Road, as well as the rich opportunities that Belt and Road projects offer. Last month, at my invitation, Mr Jin Liqun, President of Asian Infrastructure Investment Bank, AIIB, visited Hong Kong to speak to university students - both local and overseas students, in the SAR Government headquarters. Quite a few of them are from Belt and Road countries. I was delighted to see them enthralled by the prospects of AIIB. Incidentally, there were about 500 such young students with us at that event. Such vigour and enthusiasm are heartening. Our young generations must not limit themselves to the borders of their home cities. They must reach out and engage the world. Ladies and gentlemen, the Belt and Road is a vast scheme - in scope, scale and diversity. To realise the promises of the Belt and Road, we need visionary strategies and efficient co-operation between the Government, business and community in Hong Kong. That was why a dedicated government office came into being some three months ago, led by our Commissioner Yvonne Choi, to advise on Belt and Road strategies and support companies and professionals in reaching out - some of those will be partnerships between Hong Kong and Mainland enterprises. The Hong Kong Monetary Authority also opened an Infrastructure Financing Facilitation Office, IFFO, a one-stop shop for Belt and Road infrastructure investment and financing. More than 50 local, Mainland and overseas organisations have joined the Office to date as business partners. And of course, Hong Kong Economic and Trade Offices overseas, including the newly opened one in Jakarta - these are economic trade offices of the Hong Kong Government, the ETOs - together with such agencies as the Trade Development Council and Invest Hong Kong, will be there to support our businesses and companies. So Hong Kong Inc should be working as a team. Working together - Government, business and community - we, Hong Kong, will be the "key link", the "super-connector", for the Belt and Road and definitely between the Belt and Road countries and the Mainland of China. And that can only reward us all. And all means people, businesses in Hong Kong; people, businesses on the Mainland of China and overseas. So ladies and gentlemen, I wish you all happy holidays ahead and the best in the coming new year.